The mosaic of the landscape constructed from the first images revealed a rocky plain (about 20 percent of which was covered by rocks) that appears to have been deposited and shaped by catastrophic floods. This was what we had predicted based on remote-sensing data and the location of the landing site (19.13 degrees north, 33.22 degrees west), which is downstream from the mouth of Ares Vallis in the low area known as Chryse Planitia. In Viking orbiter images, the area appears analogous to the Channeled Scabland in eastern and central Washington state. This analogy suggests that Ares Vallis formed when roughly the same volume of water as in the Great Lakes (hundreds of cubic kilometers) was catastrophically released, carving the observed channel in a few weeks. The density of impact craters in the region indicates it formed at an intermediate time in Marss history, somewhere between 1.8 and 3.5 billion years ago. 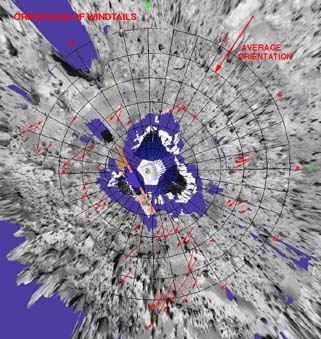 The Pathfinder images support this interpretation. They show semi-rounded pebbles, cobbles and boulders similar to those deposited by terrestrial catastrophic floods. Rocks in what we dubbed the Rock Garden  a collection of rocks to the southwest of the lander, with the names Shark, Half Dome, and Moe  are inclined and stacked, as if deposited by rapidly flowing water. Large rocks in the images (0.5 meters or larger) are flat-topped and often perched, also consistent with deposition by a flood. The Twin Peaks, a pair of hills on the southwestern horizon, are streamlined. Viking images suggest that the lander is on the flank of a broad, gentle ridge trending northeast from Twin Peaks; this ridge may be a debris tail deposited in the wake of the peaks. Small channels throughout the scene resemble those in the Channeled Scabland, where drainage in the last stage of the flood preferentially removed fine-grained materials. Taking all the results together, scientists have deduced that Mars was once more Earth-like than previously appreciated. 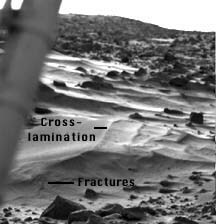 Some crustal materials on Mars resemble, in silicon content, continental crust on Earth. Moreover, the rounded pebbles and the possible conglomerate, as well as the abundant sand- and dust-sized particles, argue for a previously water-rich planet. The earlier environment seems to have been warmer and wetter, perhaps similar to that of the early Earth. In contrast, since the time that floods produced the landing site 1.8 to 3.5 billion years ago, Mars has been a very un-Earth-like place. The site appears almost unaltered since it was deposited, indicating very low erosion rates  and therefore no water in relatively recent times. 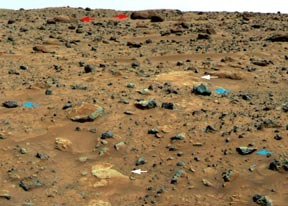 The top image is a view to the northeast of the lander and is annotated to show the variety of rocks in this landing site and what they tell us. The red arrows point to rounded boulders and rocks, thought to have been shaped by the forces of water in flood (rough edges knocked off by the tumbling action of the water). The blue arrows indicate rocks with sharp edges and points, most probably ejected from nearby impact craters and/or ancient volcanic activity. The white areas (of which Scooby Doo is one) are believed to be deposits left behind by evaporating water, or aggregates of materials fused together by the action of water. The lower image is the clearest image yet of Yogi (with the Sojourner rover taking its Alpha Proton X-ray Spectrometer measurement). It clearly shows the "two-toned" surface of this large rock. The nature of this color difference is not known, however. It might consist of wind-blown dust accumulated on the surface (the rock is leaning into the prevailing wind) or might be evidence of a break from a larger boulder as it was deposited in the ancient flood that scoured this area. This false color image of the area surrounding Yogi shows clear evidence of "scalloped" features in the soil associated with wind-blown dust. Such evidence indicates clearly the direction of prevailing winds in this area, and gives further proof of the aeolian nature of erosional processes on Mars. 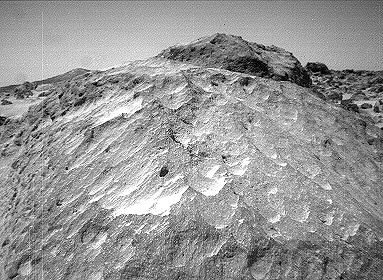 This image close-up of the rock "Moe" was taken from the Sojourner rover's left front camera on 70 (September 13). Flute-like textures on the rock, possibly caused by wind abrasion, are clearly visible. This image of the rock "Half Dome" was taken by the Sojourner rover's left front camera on Sol 71 (September 14). Pits, linear textures, and pronounced topography on the rock are clearly visible. 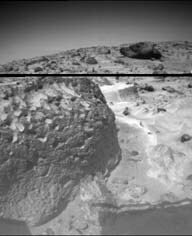 This image pair of the rock "Chimp" was taken by the Sojourner rover's front cameras on Sol 72 (September 15). Fine-scale texture on Chimp and other rocks is clearly visible. Wind tails, oriented from lower right to upper left, are seen next to small pebbles in the foreground. These were most likely produced by wind action. They came from ancient conglomerate rocks. The pebbles were rounded by water action and subsequently lithified into conglomerate rocks. Later, the waters of catastrophic floods transported the conglomerates and deposited them on the Ares Vallis flood plain. The pebbles were then freed from the rocks by weathering. 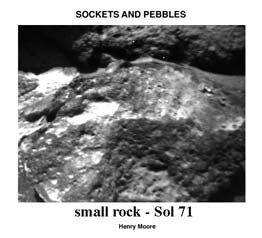 Pebbles are also seen in lander images, along with cobbles. 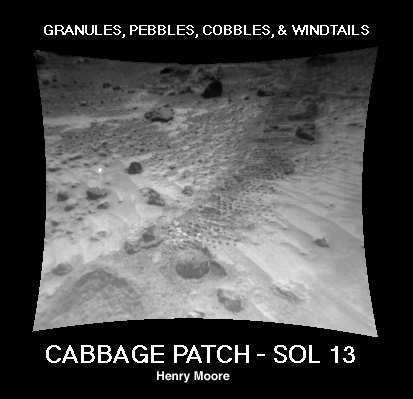 For example, in this picture, we see the same pebbles that were visible in the Sojourner rover image of the "Cabbage Patch" (Figure 1). In addition, a cobble within the rock "Lamb" (upper left) is apparent. This indicates that Lamb may be a conglomerate (Lamb is 0.32 m x 0.15 m). This color composite image from the Pathfinder lander shows the rock "Shark" at upper right (Shark is about 0.69 m wide, 0.40 m high, and 6.4 m from the lander). The rock looks like a conglomerate in Sojourner rover images, but only the large elements of its surface textures can be seen here. This demonstrates the usefulness of having a robot rover "geologist" able to examine rocks up close. 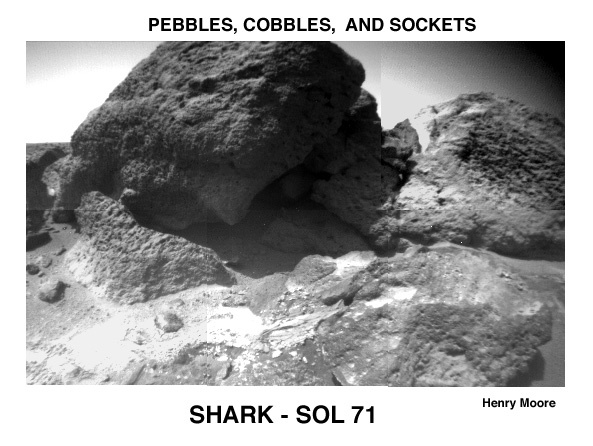 This color composite image of the "Rock Garden" shows the rocks "Shark" and "Half Dome" at upper left and middle, respectively. 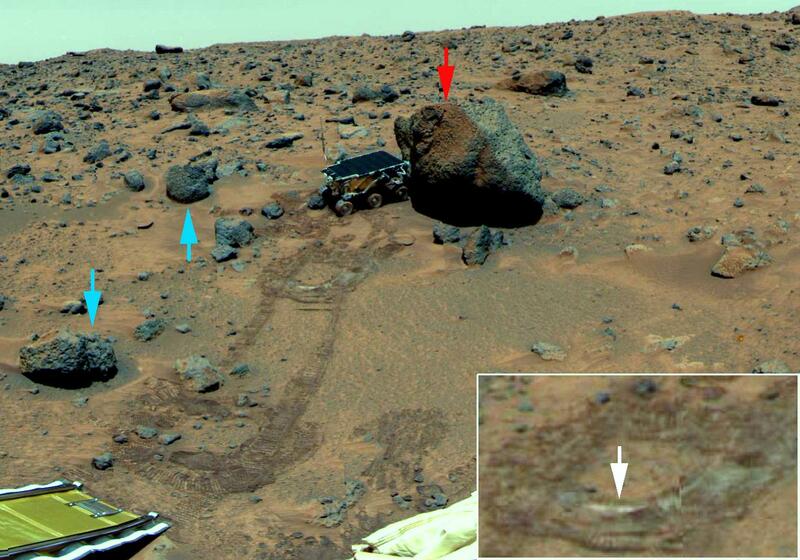 Between these two large rocks is a smaller rock ( about 0.20 m wide, 0.10m high, and 6.33 m from the lander) that was observed close-up with the Sojourner rover (see Figure 6). This close-up Sojourner rover image of a small rock shows that weathering has etched-out pebbles to produce sockets. In the image, sunlight is coming from the upper left. Sockets (with shadows on top) are visible at the lower left and pebbles (with bright tops and shadowed bases) are seen at the lower center and lower right. Two pebbles (about 0.5 cm across) are visible at the lower center. This image is of so-called wind drifts seen at the Viking 1 landing site. These are somewhat different from the features seen at the Pathfinder site in two important ways. these features may indicate erosion on one side, because of the layering and apparent scouring on their right sides. They may, therefore have been deposited by a wind moving left to right, partly or weakly cemented or solidified by surface processes at some later time, then eroded by a second wind (right to left), exposing their internal structure. 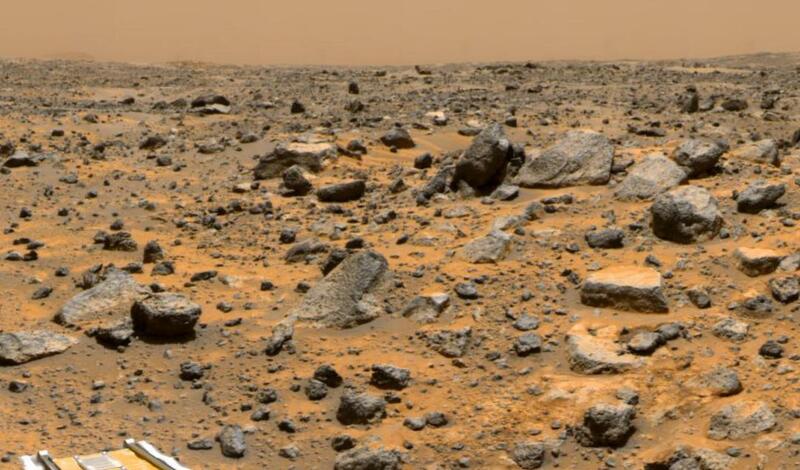 This enhanced color image of the Pathfinder landing site shows the eastern horizon. The elongated, reddish, low contrast region in the distance is "Roadrunner Flats.". This is an image from the super-pan sequence. Of importance are some of the features around the rock nicknamed Barnacle Bill in the left foreground. The rock shows a "streamlined tail" composed of particles deposited by wind on the leeward (downwind) side of the rock. Also seen is a "moat" around the opposite (windward) side of the rock where either erosion (or non-deposition) of fine sediment has occurred. Mars Pathfinder scientist believe that the wind blowing over and around rocks like Barnacle Bill creates an airflow pattern wherein a buffer zone is formed immediately upwind of the rock and airflow patterns keep sediment from being deposited directly upwind of Barnacle Bill. On the downwind side, however, the airflow is complex and a small wake and tapered "dead air zone" form. Sediment can be deposited within this region and the shape of the formed deposit corresponds to the airflow patterns that exist behind the rock. Similar features have been observed at the Viking landing sitess and are thought to form under high wind conditions during the autumn and winter seasons in the northern hemisphere. 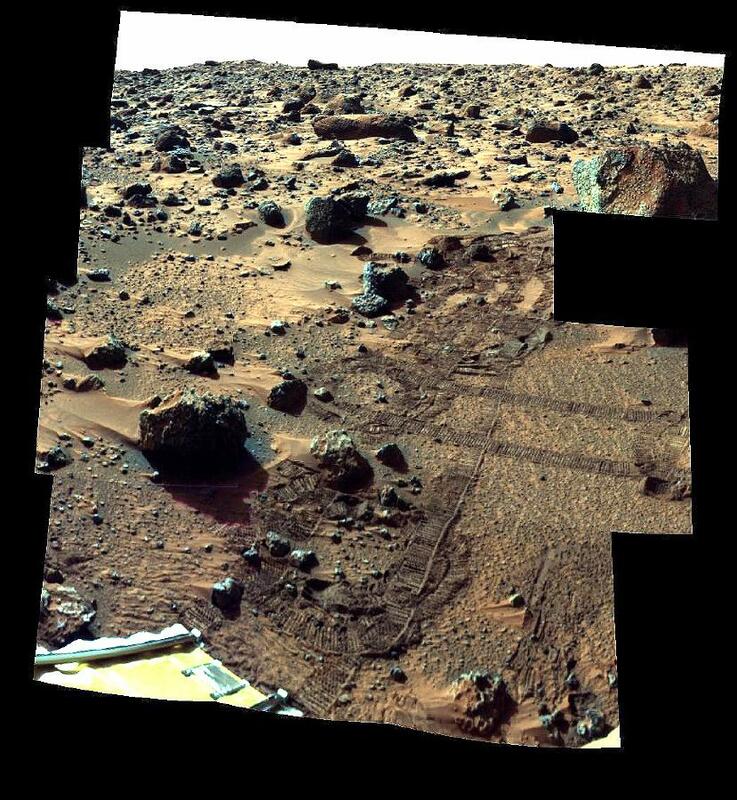 This image mosaic was processed by the U.S. Geological Survey in support of the NASA/JPL Mars Pathfinder Mars Mission. 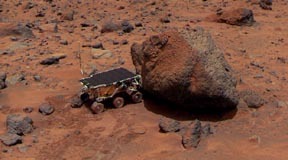 A close-up view of the rock "Moe" in the Rock Garden at the Pathfinder landing site. Moe is a meter-size boulder that, as seen from Sojourner, has a relatively smooth yet pitted texture upon close examination. Such a texture is seen on Earth on rocks that have been abraded by wind in a process that is analogous to sand blasting. This view of Moe shows two faces on the rock, one (left side of the rock) facing north-northeast and the other (right side) facing east. These two faces are thought to have been pitted and fluted by strong, "sand"-carrying winds from the northeast. This pair of images shows a broad view (upper image) and detailed close-up view (lower image) of the disturbed surface near and on Mermaid Dune. 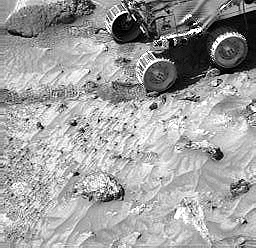 Seen slightly right of center in the upper image are two diggings by the rovers' wheel. The uppermost rut is in the surface away from Mermaid and is considered to be typical of the surface at the landing site. The closer rut represents the surface at the base of Mermaid on the upwind side. The lower image is an enlargement of the disturbed Mermaid sediments plus those of the underlying substrate; that is, the ground upon which the dune lies. Seen in the close-up are at least two types of sediment, one that seems to be approximately 1.4 cm thick and forms piles with sides sloping at approximately 35 degrees, and another at least 3 cm deep composed of sediment that has a characteristic slope of 41 degrees when piled. It is apparent in the images that there is a size range of sediment present in the rut, sediment that ranges from a few millimeters in size down to below the resolution of the camera. 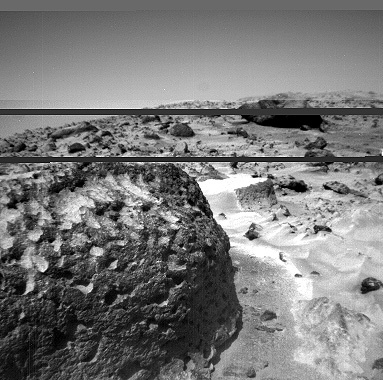 This is an image of the rover Sojourner at the feature called Mermaid Dune at the landing site. Mermaid is thought to be a low, transverse dune ridge, with its long (approximately 2 meter-) axis transverse to the wind, which is thought to come from the lower left of the image and blow toward the upper right. The rover is facing to the lower left, the "upwind" direction. The rover's middle wheels are at the crestline of the small dune, and the rear wheels are on the lee side of the feature. A soil mechanics experiment was performed to dig into the dune and examine the sediments exposed. This image was taken by the Sojourner rover in the area behind the "Rock Garden" at the Pathfinder landing site and gives a view of the Martian surface not seen from the lander. 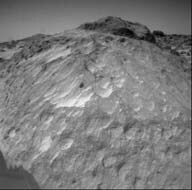 Of note here are several dune-like ridges in the foreground. These features are less than a meter high but several meters wide. They are thought to be created by surface winds blowing right to left (approximately northeast to southwest). These features are called dunes, because of their asymmetry, although the rover has not examined the sediment within them. Such sediment on Earth would be sand-size grains less than 1 millimeter in diameter. This is a representation of sediment tails noted at the Mars Pathfinder landing site. The arrows in the figure represent the inferred downwind direction, based on our understanding of the deposition of very fine sediment around surface rocks. The inferred wind direction therefore, is from the northeast blowing toward the southwest. This wind trend matched that of light and dark "streaks" of sediment in and around Martian craters in the region that were seen by the Viking spacecraft. 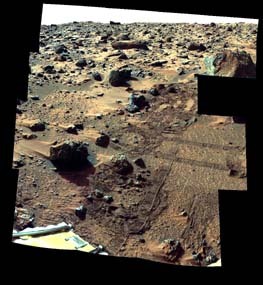 The detailed map was prepared by Mars Pathfinder scientists from Arizona State University on a base image created by MPF scientists from the NASA Ames research facility. 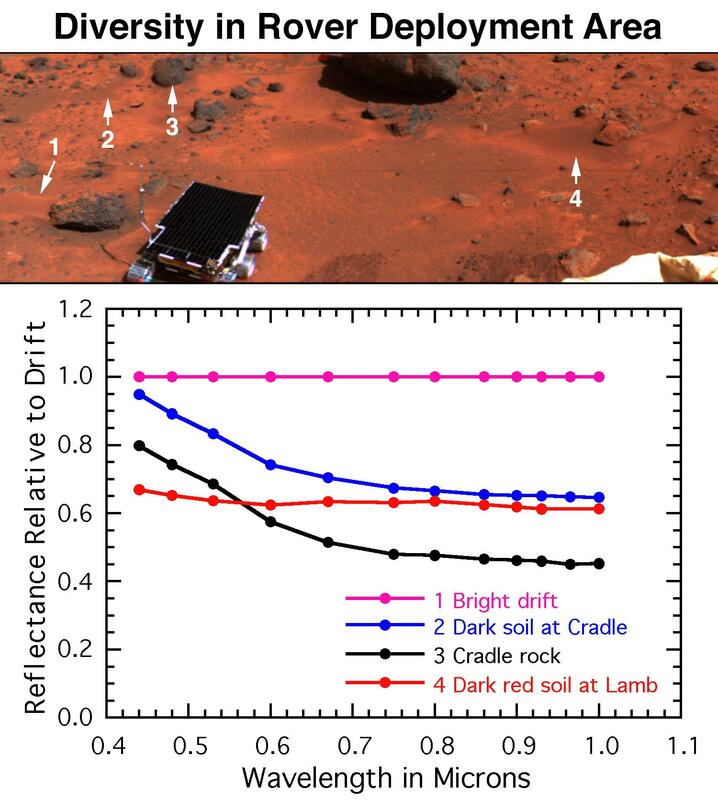 The surface near the rover's egress from the lander contains bright red drift (#1), dark gray rocks such as Cradle (#3), soil intermediate in color to the rocks and drift (#2), and dark red soil on and around the rock Lamb (#4). 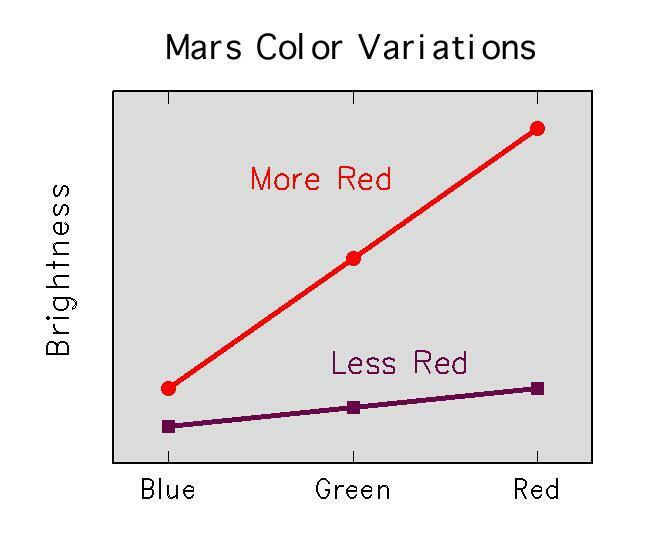 Globally, Mars is characterized by similar color variations. The spectra of these sites have been ratioed to the drift to highlight their differences. The rocks are less red and have less of a bend in the spectrum at visible wavelengths, indicating less ferric minerals and a more unweathered composition than drift. The intermediate colored soils appear intermediate in the spectral properties as well. 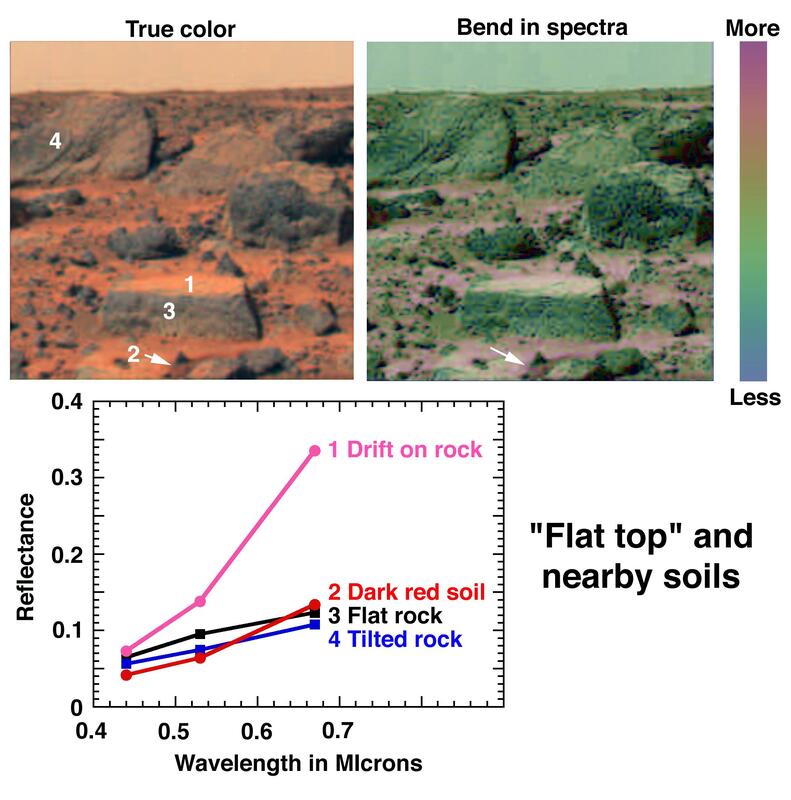 The dark red soil at Lamb is darker than drift by about equally as red; the curvature of sppectrum at visible wavelengths indicates either more ferric minerals or a larger particle size. 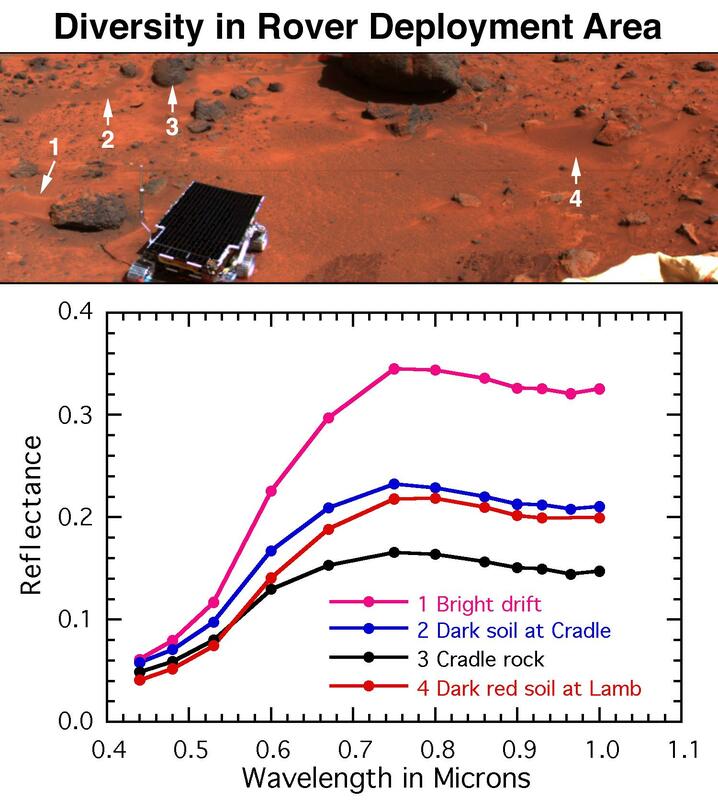 The surface near the rover's egress from the lander contains mainly bright red drift (#1), dark gray rocks such as Cradle (#3), soil intermediate in color to the rocks and drift (#2), and dark red soil on and around the rock Lamb (#4). Globally, Mars is characterized by similar color variations. The spectra, measured using the full 13- color capability of IMP, provide evidence for the mineralogy of the unweathered rocks and highly weathered red soils. 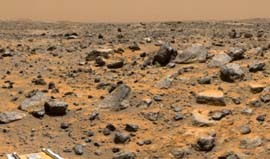 The first color panorama returned by IMP after Mars Pathfinder's landing included several larger, gray rocks, bright red dust on a flat- topped rock and the ground between the rocks, and darker red soil exposed where Pathfinder's landing dislodged a small rock. The less red color and low reflectance of the rocks is consistent with the iron minerals found in igneous rocks, whereas the fine, bright drift has a spectrum indicative of a weathering product. The strength of the bend, or "kink", in the spectrum is related to the abundance and particle size of specific crustalline, ferric weathering products. In the false color image, the blue areas have a weak kink and are relatively unweathered, whereas the red areas' strong kink indicates an abundance of ferric iron minerals. Rocks and soils on the surface are thought to be composed of minerals similar to those found on earth's surface. One of the most important tools for recognizing these minerals is the spectrum of sunlight reflected by them. 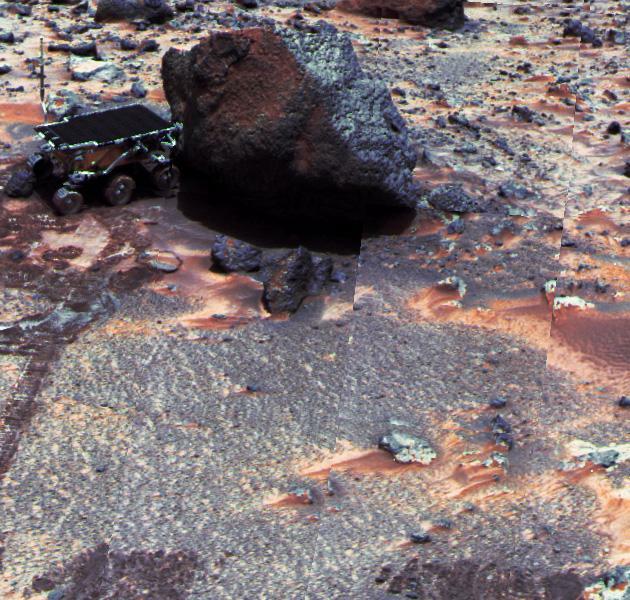 At the visible and near-infrared light wavelengths measured by the Imager for Mars Pathfinder (IMP), the most important coloring materials in the martian surface are iron minerals. There are two broad classes of iron minerals. Minerals which occur in igneous rocks (such as pyroxene) have a relatively flat spectrum and they reflect only a small amount of light; they are said to have a low reflectance. Ferric iron minerals, which occur as weathering products, reflect longer-wavelength light and absorb short-wavelength light, hence their very red color. The relative brightnesses of Martian surface materials in IMP's different wavelength filter is a powerful tool for recognizing the iron minerals present. The shapes of the spectra of surface materials can easily be measured from multispectral images. 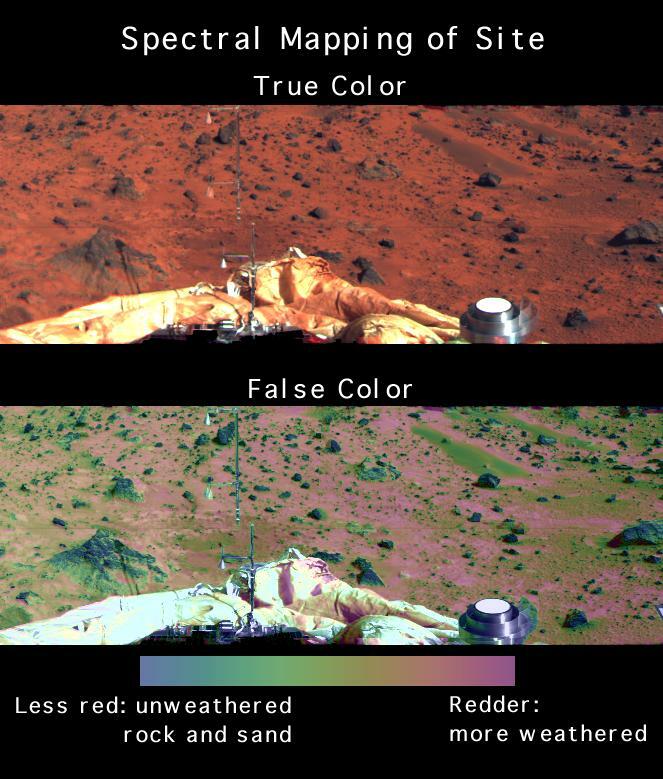 Measures of surface spectral properties can also be shown as false color overlain on an image to summarize spectral variations near the lander at a glance. The top image showns the region southeast of the lander in true color. In the bottom image of the same region, the strength of the kink in the spectrum at visible wavelengths (related to the abundance and particle size of weathered ferric iron minerals) is shown in false color. Blue rocks are the least weathered, red soils are most weathered, and green soils and rock faces show an intermediate state of weathering. 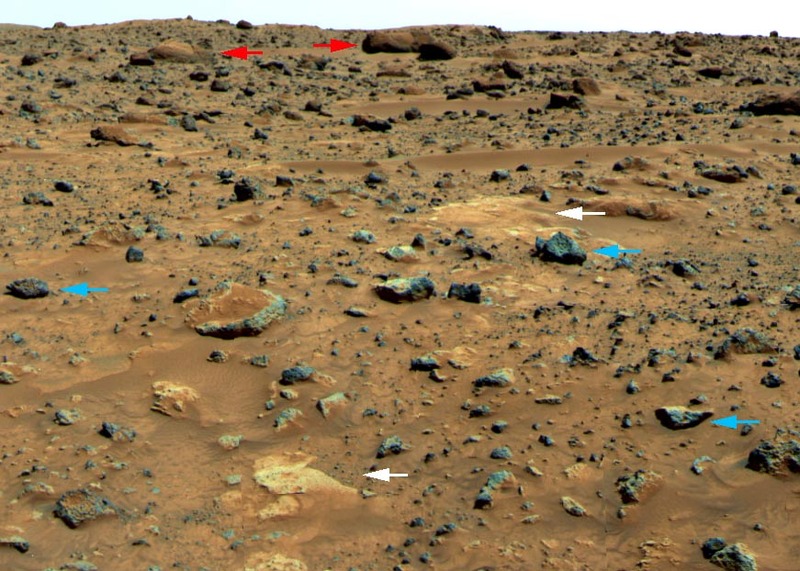 The earliest survey of spectral properties of the rocks and soils surrounding Pathfinder was acquired as a narrow strip covereing the region just beond the where the rover made its egress from the lander. The wavelength filters used, all in the binocular camera's right eye, cover mainly visible wavelengths. 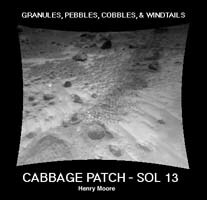 These data reveal at least five kinds of rocks and soil in the immediate vicinity of the lander. All of the spectra are ratioed to the mean spectrum of bright red drift to highlight the differences. Different occurrences of drift (pink spectra) are closely similar. Most of the rocks (black spectra) have a dark gray color, and are both darker and less red than the drift, suggesting less weathering. Typical soils (green spectra) are intermeidate in properties to the rocks and drift. 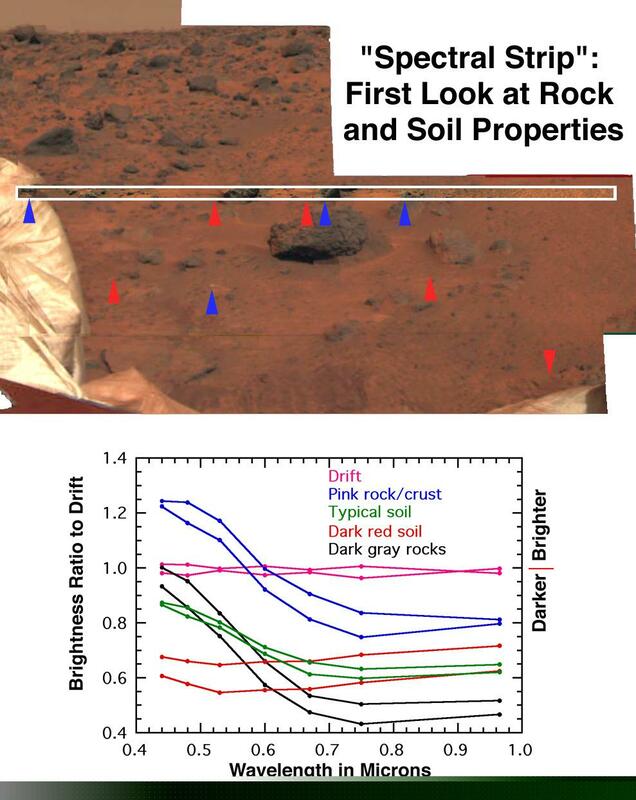 Both these data and subsequent higher resolution images show that the typical soil consists of a mixture of drift and small dark gray particles resembling the rock. However two other kinds of materials are significantly different from the rocks and drift. Pinkish or whitish pebbles and crusts on some of the rocks (blue spectra) are brighter in blue light and darker in near-infrared light than is the drift, and they lack the spectral characteristics closely associated with iron minerals. Dark red soils in the lee of several rocks are about as red as the drift, bust consistently darker. The curvature in the spectrum at visible wavelengths suggests either more ferric iron minerals than in the drift or a larger particle size. 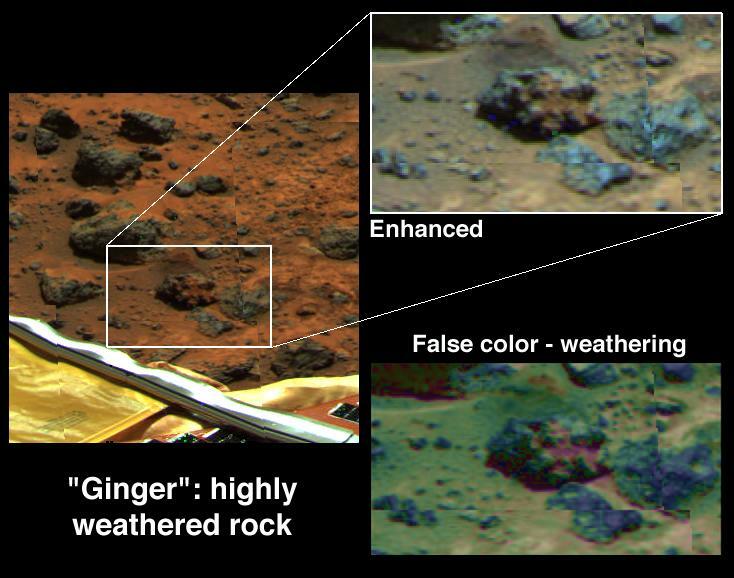 One of the more unusual rocks at the site is Ginger, located southeast of the lander. Parts of it have the reddest color of any material in view, whereas its rounded lobes are gray and relatively unweathered. These color differences are brought out in the inset, enhaced at the upper right. In the false color image at the lower right, the shape of the visible- wavelength spectrum (related to the abundance of weathered ferric iron minerals) is indicated by the hue of the rocks. Blue indicates relatively unweathered rocks. Typical soils and drift, which are heavily weathered, are shown in green and flesh tones. The very red color in the creases in the rock surface correspond to a crust of ferric minerals. The origin of the rock is uncertain; the ferric crust may have grown underneath the rock, or it may cement pebbles together into a conglomerate. Ginger will be a target of future super- resolution studies to better constrain its origin. 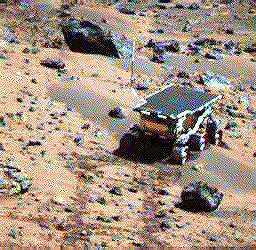 In this scene showing the rover deployed at Yogi, the colors have similarly been enhanced to bring out differences. The same three kinds of rocks are recognized as in the distance. Yogi (red arrow), one of the large rocks with a weathered coating, exhibits a fresh face to the northeast, resulting perhaps from eolian scouring or from fracturing off of pieces to expose a fresher surface. Barnacle Bill and Cradle (blue arrows) are typical of the unweathered smaller rocks. 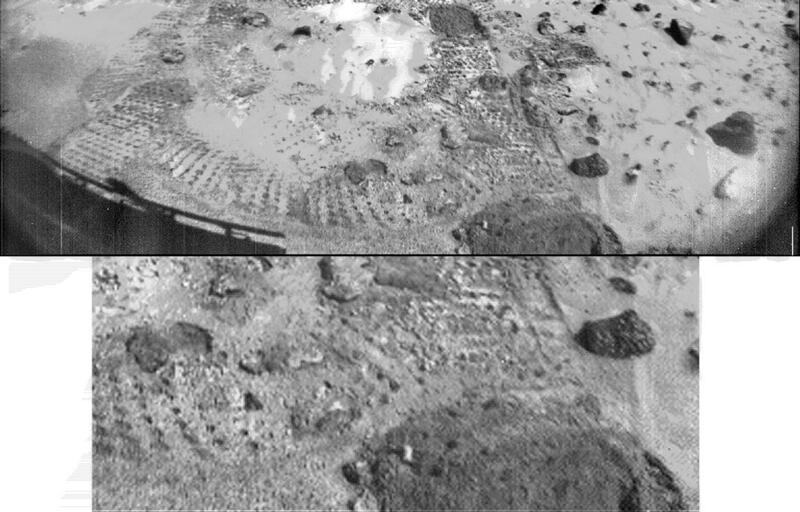 During its traverse to Yogi the rover stirred the soil and exposed material from several cm in depth. During one of the turns to deploy the APXS (inset and white arrow), the wheels dug particularly deeply and exposed white material. Spectra of this white material show it is virtually identical to Scooby Doo, and such white material may underly much of the site.